Launched in 1995, the original Honda CR-V was one of the first compact crossovers. Like most of us, however, it grew portlier with age, and over 23 years and four generations evolved into a fully-fledged family SUV. Now there’s a new, fifth-generation CR-V, available as a hybrid for the first time. It’s on sale from February 2019, priced from £29,105 for the two-wheel-drive S, rising to £37,255 for the four-wheel-drive EX. 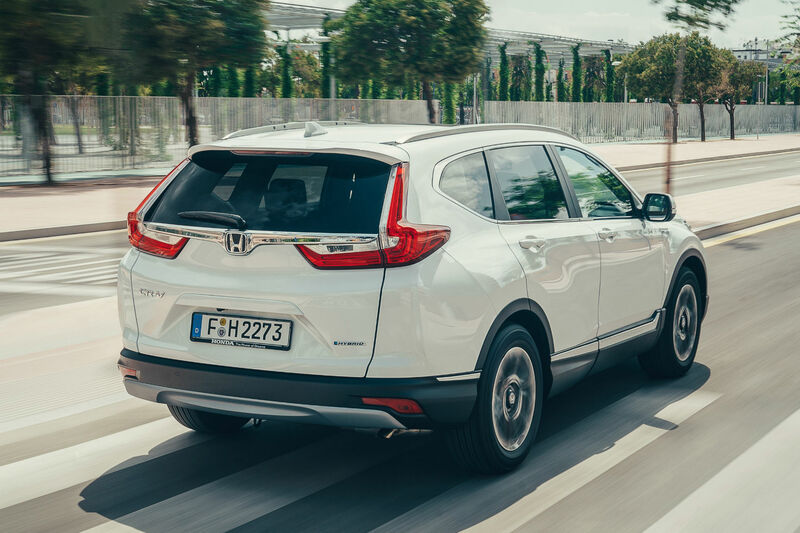 Is petrol-electric power now the best option for Honda’s steadfastly sensible SUV? And how does it stack up against rivals in this crowded class? We travelled to Seville – and the European launch – to find out. Diesel is dead, long live hybrid! Until recently, diesel was the default choice for most mid- to large-sized cars. 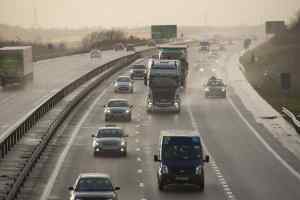 But the Volkswagen ‘dieselgate’ scandal, combined with widespread worries about nitrogen oxide (NOx) emissions, has made diesel a dirty word. “We’ve witnessed a sharp decline in diesel sales over the past two years,” explains David Hodgetts, MD of Honda UK. The answer – ditching diesel altogether – would once have been unthinkable, but that’s exactly what Honda has done. 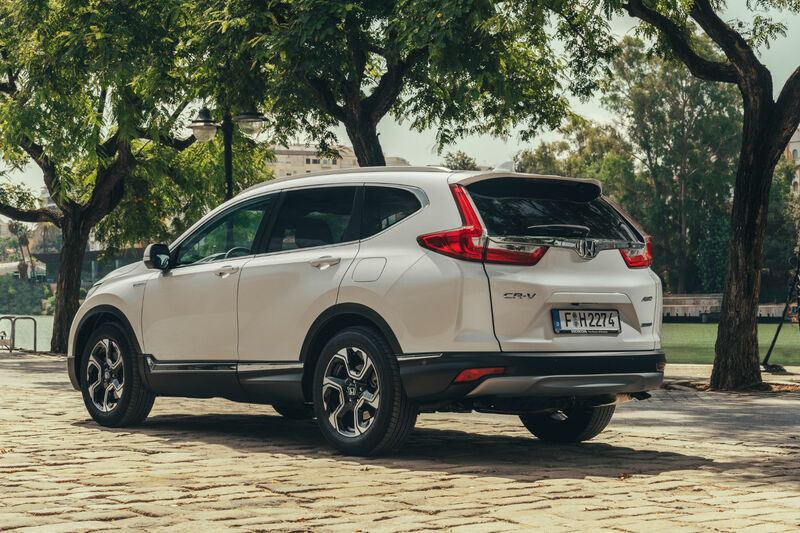 The CR-V comes with a choice of two powertrains: 173hp 1.5-litre petrol or 184hp 2.0 hybrid. Driving the new Honda CR-V Hybrid today. Unlike some hybrids, this one can’t be plugged in to boost the batteries. Nonetheless, it’s impressively efficient, with official fuel economy of 53.3mpg and CO2 emissions of 120g/km. Four-wheel drive versions manage 51.4mpg and 126g/km. For reference, that compares with between 57.3mpg and 64.2mpg for the outgoing CR-V 1.6 i-DTEC diesel, depending on spec. 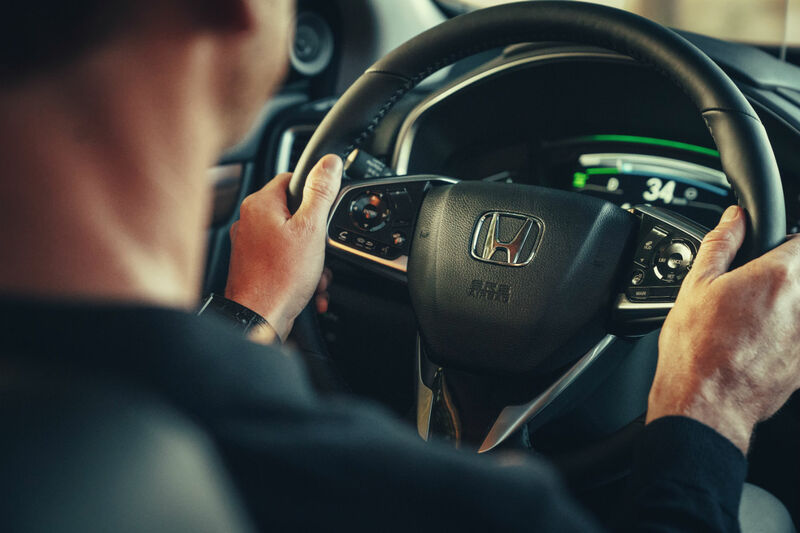 Honda’s new i-MMD (Intelligent Multi-Mode Drive) hybrid tech made its debut in the US-market Accord and Odyssey, but the CR-V is the first European model to use it. The system is a key part of the company’s plan for two thirds of its sales to be electrified (hybrid, plug-in hybrid, battery-electric or hydrogen fuel cell) by 2025. The i-MMD uses a 2.0-litre petrol engine, two electric motors (one acting as a generator) and a lithium-ion battery pack. 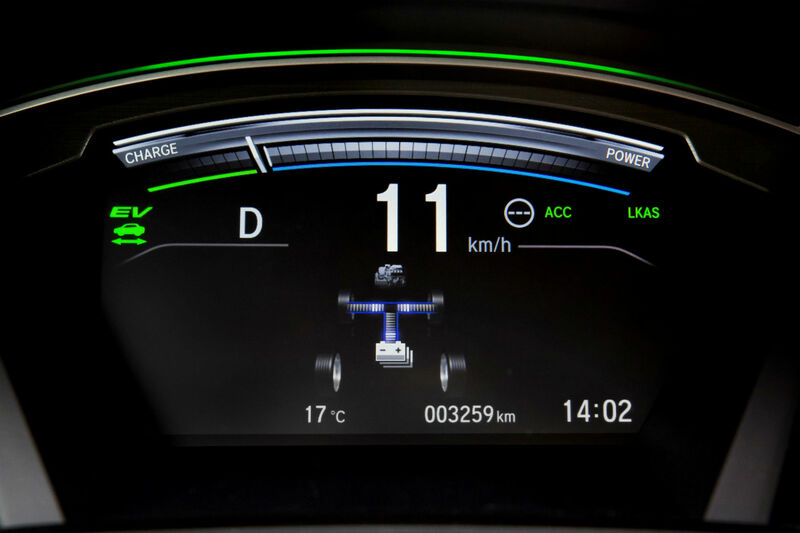 Depending on the road conditions, it automatically switches between three modes: Hybrid, EV and Engine. 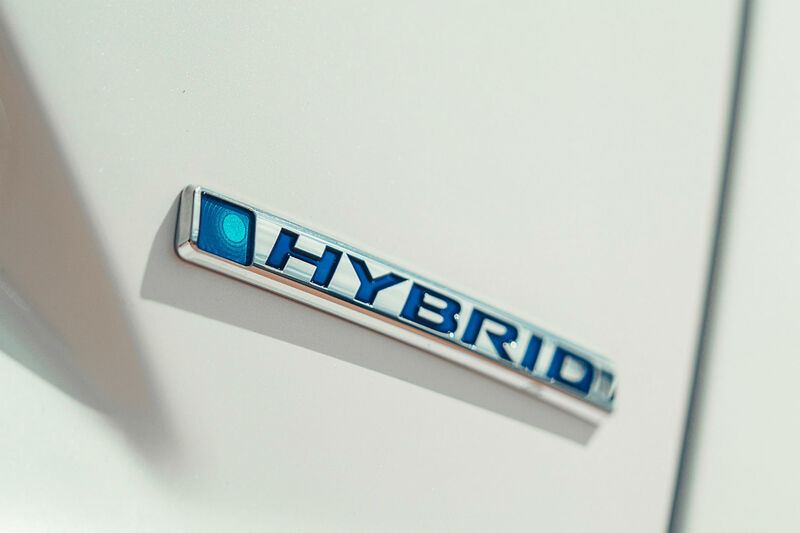 Hybrid uses the engine to power the generator, which in turn drives the electric motor – supplemented when needed by a boost from the batteries. EV is fully electric, with a range of 1.2 miles when fully charged. And Engine uses petrol power to directly drive the wheels. Most hybrids – including Toyotas – use a ‘rubber band’ planetary eCVT transmission. Honda has done things differently, with a fixed gear set-up that allows a direct connection between moving parts. The i-MMD assists the engine to keep it within its optimum 1,800-2,800rpm power band where possible. 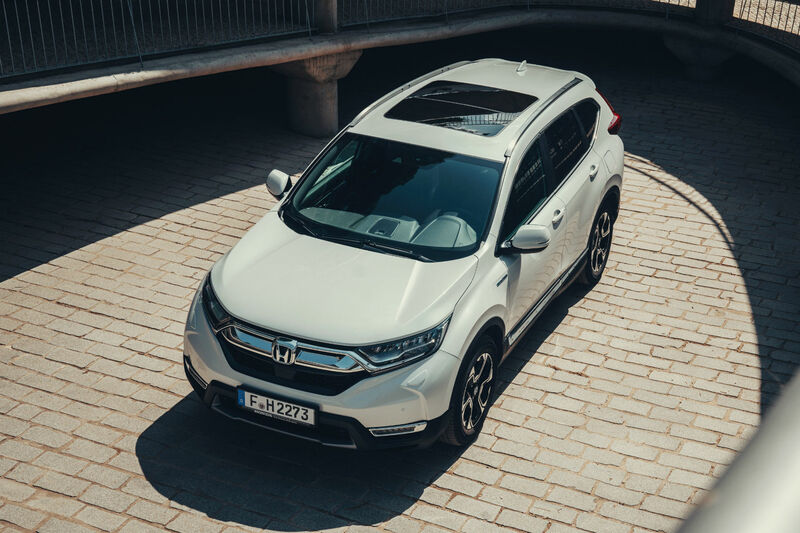 While still recognisably a CR-V, this latest model looks markedly more muscular, with a bulging bonnet, pumped-up wheelarches and a strong shoulder-line. Overall dimensions have hardly changed, but the wheelbase has grown by 30mm, giving a sportier, wheel-at-each-corner stance. There’s quite a bit more bling, too. And while we aren’t talking Cadillac quantities of chrome, you’ll note the bold grille, side-window surrounds, sill accents and gratuitous garnish between the rear lights. 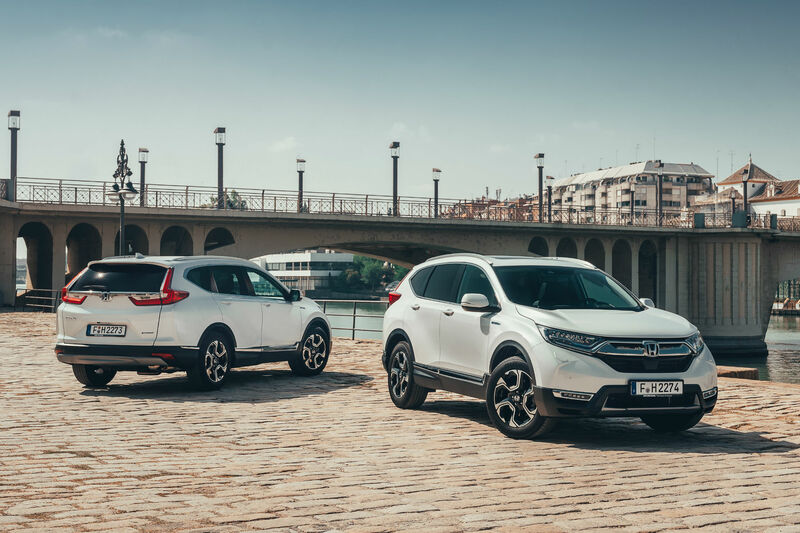 What dazzles in the Seville sunshine may not look so appealing on a grey day in Grimsby, but at least the CR-V stands out. Honda is proud of the car’s aerodynamics, citing tangible gains in fuel efficiency. An Active Grille Shutter closes off airflow into the engine bay unless needed for cooling, while a smooth underside also reduces drag. Honda’s chief competitors are mainstream marques such as Ford, Kia, Toyota and Volkswagen. When designing the CR-V’s interior, though, it benchmarked quality against upmarket brands such as Audi and Mercedes-Benz. Its efforts were only semi-successful. While fit is millimetre-perfect, the quality of some materials, along with liberal use of switchgear from the Civic hatchback, do let the side down. And don’t get us started on the fake wood trim (metal-look alternatives are available). The seven-inch touchscreen – standard on all versions except the entry-level S – also lags behind rival efforts for ease of use, and has a dated Garmin nav system. Thankfully, it supports both Apple Carplay and Android Auto, so you can use Google Maps instead. Space and practicality are still among the CR-Vs strengths. Its raised ride height makes for easy entry and exit, while even tall adults will be comfortable in the back. At 497 litres, boot capacity is on par with the best in class. 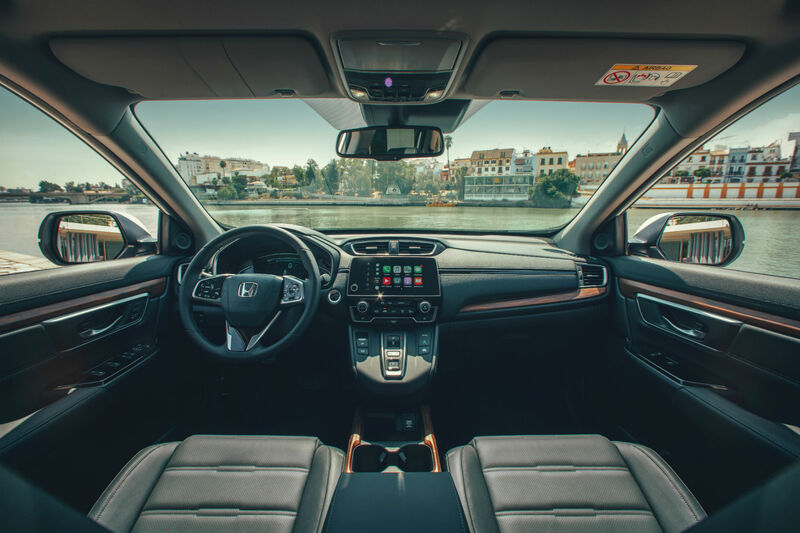 The detritus of family life can make any car feel cramped, of course, so Honda has stuffed the CR-V with cupholders, cubbyholes and power sockets. We also like the flat-folding rear seats, which drop down instantly via levers in the boot. So far, so good – but there are several caveats. Firstly, the need to accommodate the battery pack means the Hybrid has a smaller boot (by 64 litres) than the petrol model. Secondly, it only comes with five seats, whereas the petrol can (optionally) accommodate seven. And thirdly, its braked towing capacity of 750kg isn’t sufficient for large caravans. The two-wheel-drive petrol can tow 2,000kg, or 1,500kg with 4WD. The clever workings of the i-MMD mean the CR-V is fully-electric around 80% of the time in town, and still more than 50% at a 40mph cruise. Even at 62mph, it uses EV mode for approximately a third of driving. The result is calming refinement and the instant torque of an electric car. The shift between drive modes is seamless (indicator lights on the dashboard are your primary clue), and acceleration feels brisk even at motorway speeds. Interestingly, Honda has remapped this engine for Europe to make it more linear. Response feels sharper than with a CVT, but you still hear that familiar hybrid drone when you plant your right foot. An Active Sound Control system tries – and mostly fails – to counter this by pumping fake engine noise through the speakers. ‘SUV’ might be short for ‘sport-utility vehicle’, but the notion of a sporty SUV has always seemed, to us, like a contradiction in terms. Honda, wisely, wants no part of it. The CR-V is about fuss-free, comfortable transport: a brief it fulfills admirably. Indeed, the Sport button on the centre console seems rather redundant. The roads around Seville rival those in the UK for pockmarks and potholes, but the car wasn’t unduly aggravated. Its suspension is supple rather than soft, insulating passengers from unpleasant shocks while staying fairly flat when cornering. Handling is safe and predictable – exactly as loyal CR-V buyers will expect. One notable improvement here is the steering, which is direct and well weighted. Like all the CR-V’s major controls, it has a measured maturity that speaks of real engineering depth. The CR-V has the same push-button gear selector as the NSX supercar, and it could hardly be easier to use. It also obviates the need for a bulky lever, freeing up yet more stowage space between the front seats. Unusually, while you’ll discover paddles behind the steering wheel, these aren’t for changing gear. Instead, they help you slow down using engine braking. Pull the left paddle and the rate of deceleration increases in four steps. The right paddle has the opposite effect. The effect is a bit like shifting down through the gears, but seems like a bit of a gimmick. Even four pulls on the paddle are no substitute for simply applying the foot brake and the system resets itself almost immediately afterwards. That means you can’t opt for the stronger regenerative braking of some hybrids, or the one-pedal driving it offers at low speeds. Safety is a key concern for any family car, so Honda fits its ‘Sensing’ pack to all CR-Vs. The suite of systems includes automatic emergency braking, lane-departure warning, traffic-sign recognition, active cruise control (which maintains a set distance to the car in front) and lane-keeping assist (which gently nudges the steering if you drift outside the white lines). The only optional extras are blind-spot assist, cross-traffic monitor (to warn of approaching cars when reversing) and a rear-view camera – the latter which is standard from second-tier SE grade upwards anyway. At the time of writing, the CR-V hadn’t been crash-tested by Euro NCAP. However, anything less than a full five stars will surely be a disappointment. 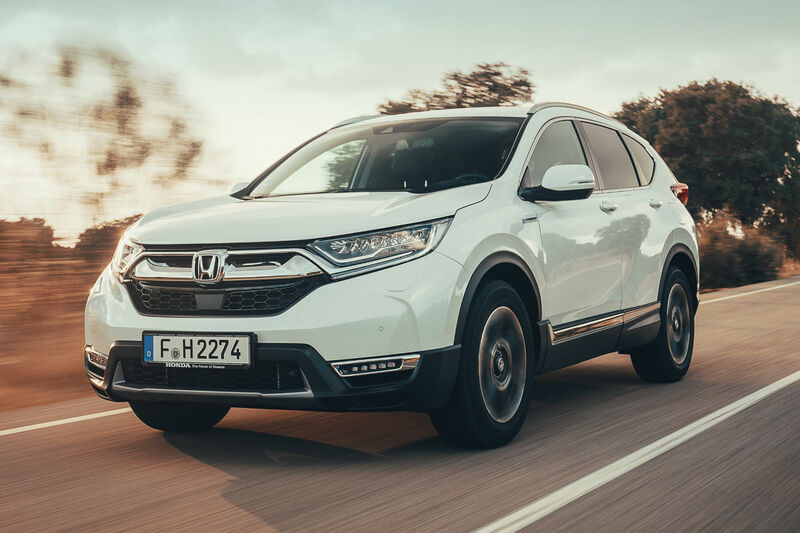 The new CR-V builds on the strengths of the outgoing model, fixing some of its flaws to achieve a well-rounded result. It’s roomy, comfortable, efficient and decent to drive, along with being well-equipped and competitively priced. Importantly, past evidence suggests it will be very reliable, too, backed up by Honda’s three-year/90,000-mile warranty. As for the Hybrid, it’s not for everyone. If you need to tow a horsebox at weekends, or regularly transport more than four passengers, petrol is the way to go. Also, a hefty average premium of £3,100 versus the petrol CR-V (significantly less if you opt for the like-for-like petrol auto) won’t be worthwhile unless your annual mileage is high, or you plan to keep the car for many years. Much will hinge on Honda’s PCP finance rates, which we should find out in December. And versus the rivals? 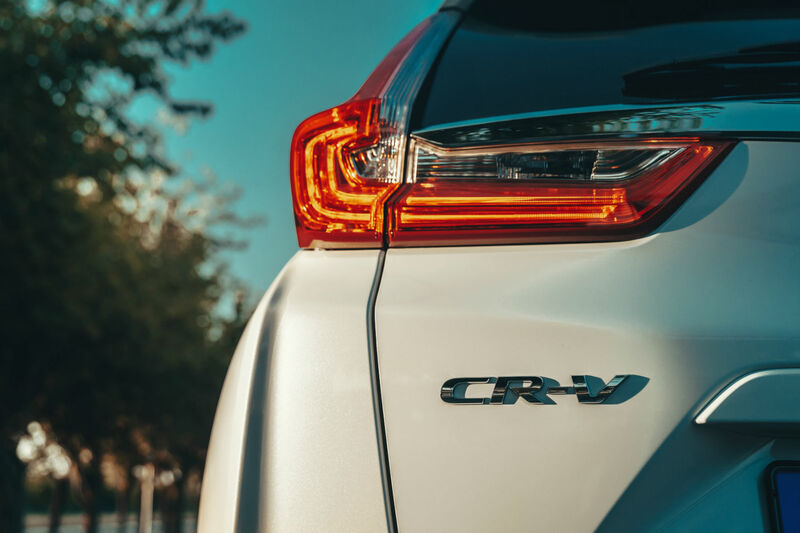 The CR-V convincingly out-points the Toyota RAV4 Hybrid, while any arguments one could have made for the Mitsubishi Outlander PHEV have decimated by the government’s decision to end the Plug-In Car Grant. 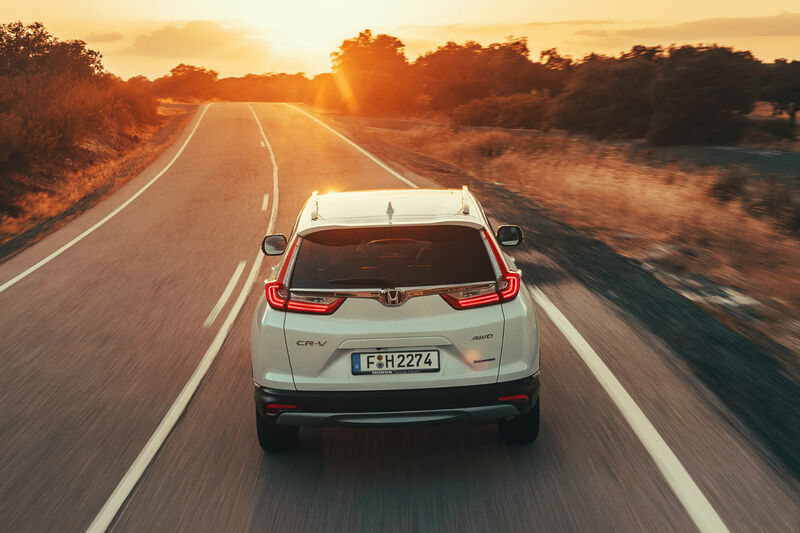 Elsewhere, your choices are mostly petrol or diesel, yet the CR-V Hybrid combines the best of both worlds.